Volunteer Nicola makes friends with one of the girls. The girls teach Anathi volunteers a new game. Three of the girls at the Jeevi home. 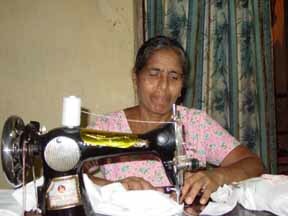 Jeevi's Ammā, or house mother. The Jeevi girls are the queens of the stage, they are constantly singing and dancing and, despite their troubles, their spirits are high. Jeevi is home to 28 girls aged from between 14 to 21. Each girl has a unique background, some are orphans, others come from families that are too poor to raise them properly. 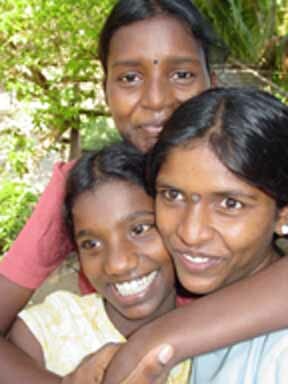 Due to the Tsunami the number of girls living in Jeevi has risen and they now have a very full house. It is lacking in basic equipment, and is in a somewhat dilapidated state. There are chips and holes in the floors, and some of the makeshift plasterboard walls are falling down. Some UK tsunami volunteers, with the help of the girls, decided to repaint the main classroom. Although it benefited from a lick of paint, there are more serious issues hiding beneath its [now shell-pink] surface. The home lacks fresh drinking water. The one well, though suitable for washing in, is not clean. A fresh water supply needs to be provided as soon as possible. There is also a severe problem with the disposal of rubbish. There is a large pile at the back of the house that is rarely burnt up. A better system is needed for its removal, perhaps more bins, or a compost heap. Although the homes are funded by Diakonia, we are still concerned about certain aspects of the home, and require outside funding for these specific problems.